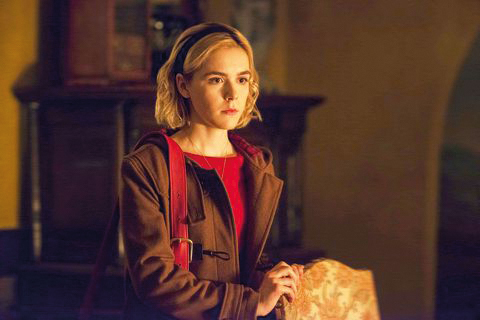 Kiernan Shipka plays the iconic Sabrina Spellman in Netflix's new teen drama, The Chilling Adventures of Sabrina (2018). From shows that keep us on the edge of our seat, to those that leave us snoring in them, we all love television. A fictional adventure, an escape from reality, a simple bit of respite for most, we love nothing more than sitting down, zoning in and chilling out. But what happens when the shows we love turn sour? Why will we continue to watch the shows we hate? In 2015, Netflix published a study in which they were able to show the point that a viewer becomes hooked on a tv show, and it is rarely, if ever the pilot episode. Although unable to pinpoint the reasons why shows catch viewers interest they could show that viewers that reached the episode that hook them, seventy per cent will watch the entire first series at least. Some shows have earlier hooks than others. Shows such as Suits and The Walking Dead were able to hook viewers by episode two while shows such as How I Met Your Mother needed viewers to reach episode eight before becoming fans. In September 20, 1979 American TV show Happy Days released an episode so strange and hard to swallow that it led to a new term to describe shows that lose their way. TV shows who “jump the shark” are programmes that become increasingly unbelievable and uninteresting to watch. Shows such as Prison Break, Gossip Girl, and Lost, are all examples, losing their way due to their increasing ridiculousness, or the show’s determination to continue after a reasonable climax has come. Unfortunately, despite viewers complaining of poor writing and planning in the later seasons of these shows, they continue to watch just to see how bad it can get, and importantly: how the absurdity ends. Some shows can attract viewership despite being of poor standard from the very beginning. Often falling under the “so bad it’s good” category, these shows will continue to entertain viewers and keep them on the hook, despite being universally poorly received from audiences or critics or both from the very beginning. Shows such as The Walking Dead, Dexter and most recently, both Roberto Aguirre-Sacasa newest creations, Riverdale and The Chilling Adventures of Sabrina, despite having a poor critical reception, and often being slated for taking a strong premise and ruining it due to poor writing or storytelling have received a large following from everyday viewers. Often these viewers will admit that these shows are poor quality, but how they just cannot seem to look away. Some shows may start off great, continue to be fantastic and manages to keep the story interesting and the viewers engaged. However, through the removal of characters, whether intentionally or not, showrunners can turn their audience against them. Sometimes, this may be justifiable, such as the removal of Kevin Spacey from House of Cards after allegations of sexual assault, or Charlie Sheen’s removal from Two and a Half Men after suffering a large mental break down. Removing characters from these shows was understandable. In comparison, shows like The US Office and Scrubs, which saw main cast members removed in later seasons and had many viewers watching simply waiting for their favourite character’s return. Of course, there are other reasons why viewers keep watching that which they hate, from the show featuring their favourite actor, to shows being spin-offs of the ones we love. Eventually it all boils down to when we will eventually bite the bullet and sever the chord that hooks us onto the shows we hate. Hopefully sooner rather than later. Who wants to be six seasons and multiple hours into a terrible show?